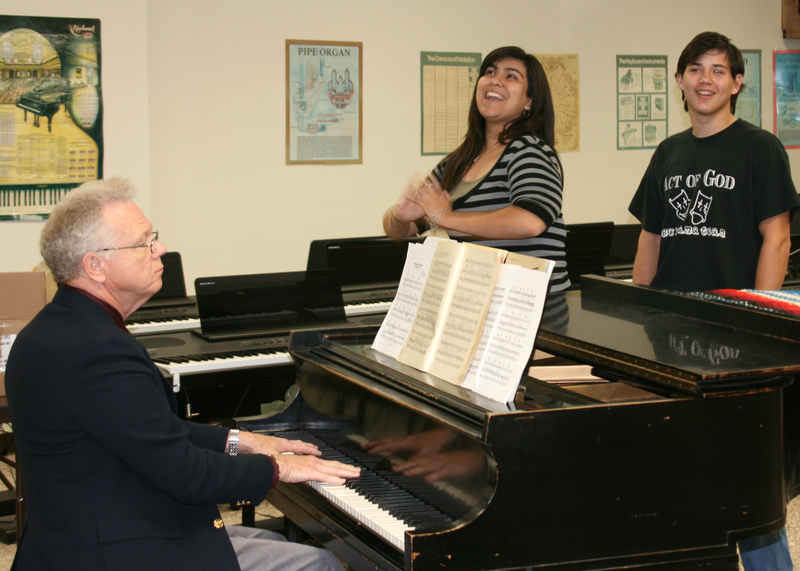 Yvonne Alaniz, as Laurey, and Thomas Brewer, as Curly, rehearse with accompanist Dr. James Lee in preparation of Coastal Bend College’s production of Oklahoma!. Enjoy Rodgers & Hammerstein’s Oklahoma! on April 29, 30; and May 1 at 7:30 p.m. at Coastal Bend College Gertrude R. Jones auditorium. The May 2 performance starts at 3 p.m. Tickets are on sale now and can be purchased at the college box office or on the website at www.coastalbend.edu. Tickets are $10 for adults and $5 for children. Oklahoma! is set in a Western native American territory just after the turn of the century. The high-spirited rivalry between the local farmers and cowboys provides the colorful background against which Curly, a handsome cowboy, and Laurey, a winsome farm girl, play out their love story. Although the road to true love never runs smooth, with these two headstrong romantics holding the reins, love’s journey is as bumpy as a surrey ride down a country road. That they will succeed in making a new life together we have no doubt, and this new life will begin in a brand-new state — Oklahoma! Rodgers & Hammerstein’s first collaboration remains, in many ways, their most innovative, having set the standard and established the rules of musical theater still being followed today. This production stars Thomas Brewer as Curly, and Yvonne Alaniz as Laurey. The stage director is Phyllis Garcia. Dr. James Lee is musical director and Gene Stephenson is orchestra director. The cast includes: Robert Ramirez as Ali Hakim; Jeannie Kesler as Aunt Eller; Phillip Brewer as Will Parker; Mikal Lotspeich as Ado Annie Carnes; Matthew Wagner as Jud Fry; Jeff Brewer as Andrew Carnes; Jamie Cano as Gertie Cummings; Daniel Jones as Ike Skidmore; Jose Arredondo, Benjamin Brewer, Duane Moore, Donna Davis, Emily Barris, Stacy Stevenson, Sharon Russell and Clarissa Garcia. Dancers, choral and ensemble performers include Ruth Brewer, Leah Brewer, Hannah Brewer, Kathleen Chambless, Cheryl Clarke, Vanessa Clarke, Lacy Etheridge, Lacy Ethridge, Leele Ethridge, Liberty Ethridge, Sally Friedlander, Clarissa Garcia, Sydnie Maguire, Sharon Russell, Caylie Russell, Janaya Brittion, Sarah Peacock, Daniel Jones, Vanessa Clark and Angelica Ulloa. Orchestra performers include Lynnsey Richey and Lupita Trevino on flutes; Lionel Edmonson and Jeff Sixsmith on clarinets; Rafael Gonzales on alto saxophone; Chuck Knowlton and Jasmine Thomsen on trumpets; Michael Gomel on trombone; A. D. Walker on tuba; and Jose A. Villarreal on percussion. For more information, contact Dr. Jim Lee at (361) 354-2303.